So you filed your property taxes last year and have been waiting for an answer. Now what? Today I want to walk you through what happens after you turn in an appeal. This is good to know for home owners as well as real estate professionals. 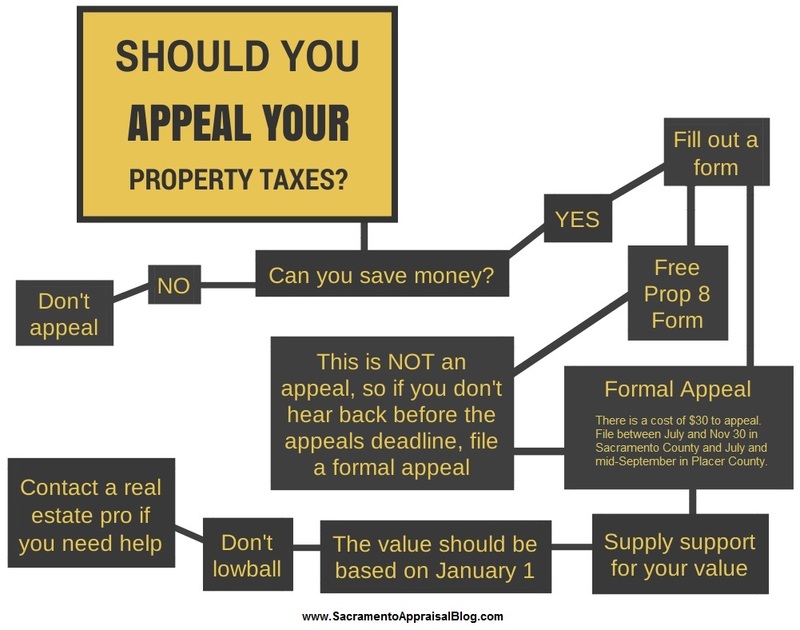 After Filing an Appeal: Once you dispute your property taxes, if you provide good support for your value, chances are the Assessor may weigh your situation carefully and either agree with you or offer you a value that is somewhat close to your proposed value. But it doesn’t always play out like that. The truth is even if you provide stellar data and give the best written presentation possible when filing an appeal, you can still get a “Notice of Hearing” form which sets up a date for you or your agent to appear at an appeals hearing. This hearing is generally the last opportunity to make your case for a lower assessed value. Does a “Notice of Hearing” mean your value has been rejected? Not at all. Keep in mind sometimes these notices in Sacramento County are mailed automatically if the Assessor’s appraiser has yet to get to your file before a certain date. However, it could also be due to the appraiser not agreeing with your value. You’ll never know until you contact the Assessor (I do this for my clients). A Real Life Communication Example: Let’s consider the example above. A home owner contacted me to help provide her with a valuation during the process of her tax appeal. I put together a very solid report to clearly illustrate market value. Even the graphs in my report made it incredibly obvious that her property was in no way worth $251,000. However, I still received a “Notice of Hearing” to make an appearance at an Appeals Hearing. This notice was in no way due to my work, but rather the Assessor’s appraiser was not able to view the property’s file before the “Notice of Hearing” mailer deadline. This means I had to contact the Assessor’s appraiser to talk about the property once the notice came in the mail. Thankfully after reaching the appraiser it was a smooth process, and the appraiser ended up reducing the value by $121,000 (about $1,500 in savings). In light of the agreed upon verbal reduction, I then received the “Tax Withdrawal Form” from the Assessor and then faxed it to their office to basically resolve the appeal by agreeing to the new value listed. It would have been ideal to get the Tax Withdrawal Form in the first place since my original report was already conclusive, but this is how it works. Sometimes there are a couple of extra hoops of communication to jump through. This case was actually easy, but others have taken much longer. In short, this is a small example, but it helps illustrate what it’s like to communicate regarding property taxes. Sometimes it can be smooth, but in many cases it’s a huge pain there are inconveniences that cause minor delays (which add up over time). It takes time: Be patient with the process as it can take a while to work it out. Strategic use of manners: Be diplomatic with the Assessor’s office. Avoid name-calling or rudeness. Negotiate a new value by calling: If you get a Notice of Hearing letter, contact the appraiser listed on the form to try to work out a value before the hearing takes place. Just because there is a scheduled hearing does not mean the hearing has to actually happen. It saves you and the Assessor time if you can come to an agreement before the hearing. Get good support: If you don’t have any support for your value or research, you should hire someone to help you. For instance, I am talking with a property owner right now about his hearing in 40 days. He has zero support for his value when he filed last year, so he really needs something to give to the Assessor (or have me do it for him). Be ready when making the call: Keep in mind sometimes a discussion about the value of your property ensues on the phone when calling the appraiser after getting a “Notice of Hearing.” The conversation can be critical for the Assessor’s interpretation of the market, so have your research ready before making the phone call. This is where really knowing the comps and neighborhood market comes in handy. I hope this was helpful and you now have a bit more insight on what might happen after you file your property taxes. Let me know if you have any questions.